A DJ who listens to you! We'll play the songs you want to hear, at the volume you prefer! We'll e-mail a songlist so you can pick every tune. Or, if you tell us your favorite recording artists, we'll take care of the rest. We've DJ'd over 1500 events and know the songs that will fill the dance floor! We'll help coordinate and make announcements. Often, we start with piano or electric piano, then switch to DJ for dancing. For even more interest, we can add sax, flute or cello. jazz trio, and include drums. we know how to read a crowd and call the shots on-the-spot, leaving no "dead air". 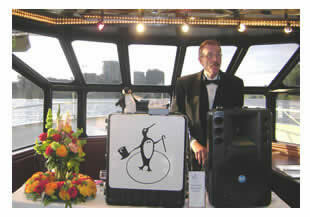 Outstanding references and years of experience doing elegant events are the most important criteria for picking a DJ. Go with a pro!